The National Anthem Law, which the government tabled to the Legislative Council in the middle of last month, will not undermine Hong Kong people's rights and freedoms, says Raymond Tam Chi-yuen, a National People's Congress deputy. "The legislative proposal is quite moderate," said Tam, who had the National Anthem Law on his portfolio in the previous government, when he was secretary for constitutional and mainland affairs. "The law designates special dates and occasions for singing the national anthem, while singing of the national anthem is encouraged in schools by way of education without carrying any penalty," Tam said. "The spirit of the legislation does not aim to punish people who offend the law inadvertently. It will only punish those who willfully distort or insult the national anthem." Tam is aware that people from the opposition camp have proposed many extreme, weird scenarios and made unsubstantiated claims that the National Anthem Law would harm freedom of speech and creation. Refuting their claims, he said the national anthem is very solemn thing. In no way will it infringe on freedom of speech or shall it become a target of parody. "Like anywhere in the world, liberties of any kind are not without limit," Tam stressed. "There should be reasonable restrictions, such as restrictions related to national security, public order and public health as stipulated in Article 12 of the International Covenant on Civil and Political Rights. While people enjoy the rights, they at the same time are obliged to obey the laws of Hong Kong." He noted some people's fears they will unknowingly break the law if they do not sing along when the anthem is broadcast on TV in a restaurant. He said that this is surely unwarranted panic as restaurants are not designated places. "Flag-raising ceremonies on July 1 and Oct 1 are occasions designated by law and people have to be solemn when the national anthem is played. Even when you visit the United States, you need to be solemn when the US national anthem is played." Tam stressed Hong Kong had a duty to enact the National Anthem Law after it was incorporated into Annex III of the Basic Law. 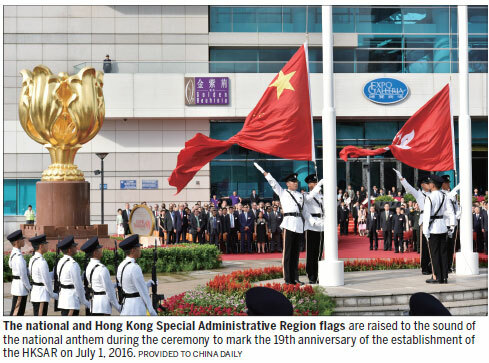 Having the option of direct promulgation and domestic legislation, the special administrative region government prefers local legislation, adapting the National Anthem Law to suit Hong Kong's situation. Tam is optimistic that it will not take too long to pass the National Anthem Law although the opposition camp will, as a habit, filibuster and delay. "They have said a lot of (clumsy) things, yet they fail to stir up trouble or cause disturbances in society," he commented. On national security legislation prescribed by Article 23 of the Basic Law, he suggested the right time would be September 2020 following the LegCo election, to save it from being abused as an election issue; the government should do some groundwork in the meantime. "Yet, the 2003 drafts are no longer applicable to the contemporary global and internal situations," he said. "Many years have passed and we have seen big changes internationally, the rise of terrorist and separatist activities, knowing the central government attaches the utmost importance to national security, sovereignty and development interests," Tam explained.